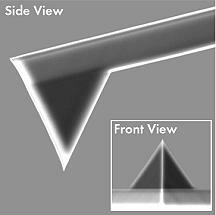 NanoWorld Arrow™ EFM probes are designed for electrostatic force microscopy. The force constant and the special coating of the EFM type are optimised for this type of application. This type of probe yields very high force sensitivity, while simultaneously enabling tapping and lift mode operation.